When you love to sew, it won’t take long for you to discover the art of making quilts, little by little you’ll fall in love with it, soon you will try different techniques and designs. Quilts can be also be made by adding some embroidery on them, today I’m sharing the basic embroidery stitches’ for your quilts. The first quilts that were made with some embroidery stitches’ were the crazy quilts, but little by little quilters have been adding more and more embroidery to their quilts no matter the design or the technique. Different embroidery stitches’ can be part of any quilt, from the simple hand quilting stitches’ made with the embroidery floss to the most complicated embroidery stitches’ that form part of the quilt design. Learning the basic embroidery stitches’ to add to any quilt will help you to start doing some embroidery to your quilts and transform them into a work of art. What kind of embroidery can I make on quilts? These embroidery stitches’ are easy to make on any quilt before or after the quilt is quilted. 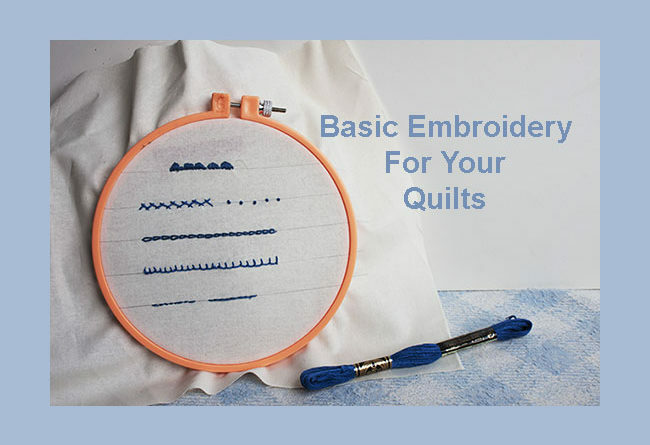 You can always start making a block and try some embroidery stitches’ on it to make a pillow, as you keep working on adding some embroidery stitches’ you might fall in love with this new technique to make your own quilts. What rules should I follow to make the embroidery stitches’ on my quilts? There’s no rules to follow when you do embroidery on a quilt, I could say. You can find some great quilts patterns to follow to make amazing quilts, but if you’re a quilter like me, that likes to follow your heart when making a quilt, soon you’ll be making a few new stitches’ here and there on your own quilts. Two amazing quilters that makes their quilts with all kind of embroidery stitches’ on them are Sue Spargo and Jude Hill, you can take a look to their websites and get inspired by their art of making beautiful quilts. How to make the basic embroidery stitches’ on your quilts. You can make the embroidery stitches’ before or after the quilting, you can use a hoop or not, I usually use the hoop to do the embroidery before I do the quilting, but once the quilt is quilted you can do the embroidery without the hoop. What kind of thread you can use to make the embroidery on a quilt. There are many threads you can use to do the embroidery on a quilt, this time I’m sharing how I do the embroidery on a quilt by hand. I use mostly the DMC embroidery floss, I can use two or three threads on the needle. If you’re new to the embroidery technique, you might want to make a simple embroidery on a fabric to make a block for your next quilt. Today I have for you a free embroidery pattern to make with the back stitch, satin stitch and a few french knots on it. You can download the pattern here, you will get a PDF with a few instructions that will help you to transfer the pattern on the fabric. I made a video where I show you how to make the different stitches’, it’s in Spanish, but as you watch it, you’ll get the way I work every stitch on the embroidery. Visit the Quilts Tools Page to learn more about what tools I use to make my quilts, I share some affiliate links there so you can get your own quilting tools too. Embroidery Stitches To Make On a Quilt – Tutorial. Today I have no tutorial to write, as I think it’s better to watch the video where I’m sharing the way I do these basic embroidery stitches’. To make the basic stitches’ embroidery sampler, you can mark a few lines with the help of a pencil for fabric on the fabric. These lines will be helpful for you to work on the different stitches’. Watch the video where I show you how to do each embroidery stitch. Your sampler will look like this after you finish making the embroidery stitches’ on it, all these stitches’ are easy to make. You can download the FREE Embroidery Pattern and transfer it on the fabric with the window method, by tapping the pattern to a window and tape on the pattern the fabric, using a pencil for fabrics, trace all the lines from the pattern on the fabric. The free embroidery pattern will look like this once you finish the embroidery, simple embroidery stitches’ will help you to make amazing embroidery work. This time, I just share the free embroidery patterns, but I want you surprise me and show me how you will use it for. Will it be on the hoop? or you will add it on a pillow? will it be part of a quilt? Let me know and show me a picture of your work once you finish it! If you share it on your Social Media add the #patchworkwithalex so I can see it. If you share it on your blog, leave me a comment here so I can visit your blog! You always can save the PIN on your Pinterest account, so you can find again my blog!